momof3 Love, love, love the new magiclip dresses for the mini princess dolls! The hard plastic dresses go on easy (my 3 yr old can do it!) AND they stand up on their own. (The soft rubber dresses are a PAIN to get on and don't stand up after time.) This carriage is just adorable! While the dolls can't really "sit" down on the benches, you can fit quite a few of them in there! My daughter loves hauling around all her princess. 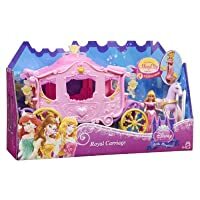 Would have 5 stars except it's pretty difficult to get the plastic connection pieces from the carriage to the horse to stay put - they are always falling off. I ended up glueing the reigns to the horse harness - works quite a bit better. Gmabass 3 1/2 yr old gradndaughter loves it but the harness does not stay attached to the horse or carriage. Tried rubber bands without luck so am going to try pipe cleaners. Had to buy more princesses! Humble Reviewer The design of the harness attaching the horse to the carriage is a complete disaster. Kept coming off. My 3-year-old daughter was not too happy about this. I guess it was designed for a Disney Princess who sits in the carriage waiting to go somewhere, not knowing the horse has already taken off and there's no way of keeping it attached to the carriage. A's Mom The design of the harness attaching the horse to the carriage is a complete disaster. Kept coming off. My 3-year-old daughter was not too happy about this. 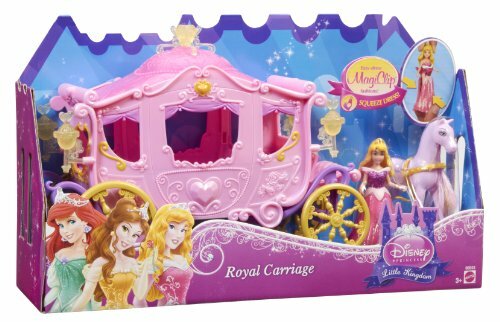 I guess it was designed for a Disney Princess who sits in the carriage waiting to go somewhere, not knowing the horse has already taken off and there's no way of keeping it attached to the carriage. Mom in NC I wouldn't buy this unless you like putting the darn thing back together every 2 minutes. The horse comes off of the carriage constantly. I wouldn't buy this again to save my life!